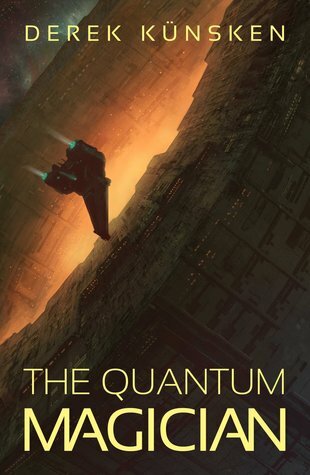 The Quantum Magician is the debut sci-fi novel from Derek Künsken. It’s a book nominally about a heist and a con, moving some impossibly precious things from one place to another without interacting with the intervening authorities. But it’s also a story about humanity and transhumanism; about the way people are willing to change themselves or others to adapt to an environment, and about the costs that are born out of that decision. It’s about old friendships and new alliances – the trust you can put into those who have never betrayed you, and in those who have hurt you before. It’s a human story – well, mostly. One about people, the way they interact with each other, what they’re willing to do, and what (or who) they’re willing to compromise to reach their goals. But there’s also a sweeping array of space battles, and a sprawling universe out there to explore between warhead splashes. Belisarius is the centre of the story – part of a new species of human, one able to make astounding leaps of intellectual analysis by stepping away from their individuality. Belisarius is charming, thoughtful, and clearly off the map of standard humanity. He struggles with his own identity, with the sense of being himself. At the same time, he’s willing to disperse his consciousness for focus, to obviate the self for the sake of more mundane goals. There are some allusions to engineered individuals being focused on the broader concepts of the universe, unwilling to engage with the minutiae, with individuals who work within a cash economy and are willing to discourage disagreement through superior firepower. Belisarius isn’t one of these – he ties up to reality, and seems largely willing to accept its existence, despite his priorities being elsewhere. Some od that is just a desire to keep his mind engaged, to escape the cosmic unutterables of the universe and get down and dirty with the human. Bel is an intriguing creature, one struggling against a genetically engrained purpose. They are at once an endorsement of the individuality of consciousness, and a triumph, or warning, of the results of engineering. Belisarius, delightful as they are, complex as they are, struggling, human as they are, is not the only individual on the page. There are some truly startling post-Sapiens individuals. These include an individual from the deep pressure divers – built to populate a liquid pressure environment far higher than normal, and survive, never comfortable, but unable to return to the world outside – and the Puppets. The puppets are a masterpiece. A populace created to experience awe under pheremonal cues, a subservient species of man, They overthrew their masters, not in revulsion to their genetic goals, but in their service – protecting their living deities by restricting access, by refusing to obey damaging commands, by taking the personal gods thy were given and breaking them on the wheel. The Puppets are breathtaking, a species of man which works within constrains but expands, horrifyingly and understandably, beyond them. There are other characters of course. Belisarius is smart, funny, and can talk people into anything, but that’s the con. He needs people. Puppets. Doctors. Monsters. Lunatics. Each makes the heart sing and hurt in equal measure. The individual in a tank, living for speed outside their pressure boundary, fighting and killing and willing to accept a creed of death before acquiescence shares a table with an ex-Marine whose enthusiasm for explosives may be a smidge out of hand. If t hey’re not as much there as Belisarius, still they carry the full freight of humanity on their shoulders, odd as it may be in some cases. This is a story about a con, to be sure, and it has the highly tense emotional weight to prove it, the payoff which rewards you for turning pages. But it’s a story about people, as well, about the larger unions – how a client state struggles against colonialism, how it tries to overthrow its masters – and about the individual, about the self-realisation of our actors. Admittedly that realisation if often backed by explosives. If you’re not here for the imaginatively and evocatively realised universe, or the compellingly flawed characters that make up Belisarius’ flawed team of con artists and criminals, you might be here for the plot, and the wonder. It’s out there, in a larger universe, one of unexplained, ancient alien artefacts, manipulated by segments of humanity close enough to be recognisable, and odd enough to be alien. There’s immediate politics, too, backed by the kind of gunboat diplomacy that gets your attention. Then there are worlds teeming with the broken, the accepted the outcast, the strange and wonderful – and the text gives you environs which bring them to life. It’s a universe tied together by jump points, at least in part sustained by unutterably ancient and unknowable external actors. It’s an intriguing world, one which clearly has several further layers out of view, behind the transhuman cast, the foul-mouthed marines and frantic interstellar battles. The atmosphere is one of a heist, that thin wire of tension drawing you from page to page, waiting for each other shoe to drop, each cunning stratagem to either unfurl or unravel. It’s handled with a stately precision, revealed to the reader like clockwork, giving us enough room to guess what’s coming, to hope and wonder and despair – and then to be blindsided by the result. 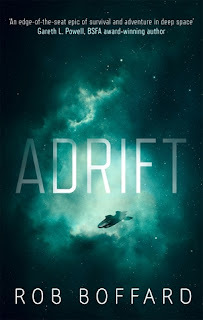 Con games and heists are always hard to write – one like this, which comes out pitch perfect, wrapped in a nuanced and striking sci-fi narrative is, to say the least, a rarity. In some ways this is a story about a con game – with segments of meticulous planning, with character analysis, with motivation a primary factor. In other ways it’s a space opera – with carefully analysed science, with high stakes and high yield munitions. In other ways it’s a character study of the ways man can rebuild man, and they way they can react. In all those ways, this is a book you want to read. 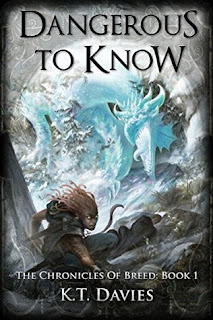 Dangerous To Know is the first in a duo of fantasy novels by K.T. Davies. It follows the misadventures of the titular Breed, a misanthropic, magically engineered killing machine, as he tries to escape the attentions of his sociopathic mage of a mother, the curse of a demon, and a whole host of others that would like to kill him. Usually with cause. It’s got magic, history to go with it, as well as complex, evolving characters with a penchant for vicious banter, and steel-edged, page turning plot. It is, in short, a lot of fun. As the title may indicate, Breed is the centrepiece of the text, and a rather dangerous one at that. Breed is a Warspawn – or at least, partially. These were monsters, bred for war in long ago battles against demons and hordes of darkness. Now they’re socially and politically suspect. Nobody likes a seven-foot lizard who can eviscerate them on a whim, after all. Especially when they’re a minority, and easy to blame. It does allow the text to quietly explore ideas of social and racial stereotyping, looking at the Warspawn as a group, looked down on and maligned by the majority of the population that they were originally built to help preserve. Breed is a reaction to that. He’s smart, often sharp enough to cut himself. But he’s also got something of a temper, paired with an absolute refusal to take any crap. From the reader’s point of view, this is an absolute delight – watching Breed meet repression with a mixture of sarcasm and brutality never gets old. It does, however, tend to escalate, leading him into rather a lot of trouble. Breed is also reliably selfish. People haven’t been good to him, and his public face is one which rejects intimacy or even friendship, in favour of sticking knives into people and lifting their wallets from their still cooling corpses. Breed has been shaped by his environs, and it’snot a good look, to put it mildly. On the other hand, though he’s always willing to sacrifices a comrade if necessary, or take ruthless and brutal action when required, there’s still a lot of raw emotion floating round internally. Some of it is rage, lets be fair. Actually, rather a lot of it is rage. But if he doesn’t like the group of people he’s with, still he doesn’t find it in himself to throw them away. At least not often. Unless it’s necessary. Breed’s journey here is one which isn’t deliberately of self discovery. Still, in achieving his goals, in tearing free from the enforced obligations which keep him inside the social constructs which have shaped and denigrated his people, Breed will get closer to understanding himself, and maybe making something of his own purpose. In the meantime, however, he has to fend off the geas of a demon, and retrieve the weapon of one of humanity’s greatest heroes. In which quest, he has some help. That help, admittedly, consists of a quiet girl, a semi-senile, drug-addled geriatric, and a priest-magician with what Breed feels are far too many morals. The first two are sadly underutilised; where they’re in the frame, it’s often for last-second assistance, comic effect, or the odd bit of foreshadowing. I liked what I saw of them, but as it was infrequent and from Breed’s perspective, it felt like the surface over deeper seas. Still, when they were there, they were engaging; it would’ve been great if they had a little more to do. The priest, however, gets a little more room. An idealist, he’s striving to both prepare the world for what he foresees as a time of coming darkness, and to stop the population from blaming everything on the already looked-down on non-human population. Thankfully, that idealism is backed up by some serious magical firepower. The clash between this idealism and Breed’s hard-headed pragmatism leads to some excellent, if often unspoken, dialogue, and lets us contrast our protagonist with a person who, in a simpler book, would be the hero. Together, this merry band of occasionally bloodthirsty lunatics set out to find an artefact and, coincidentally, save the world – or, at least, stop it from getting any worse. 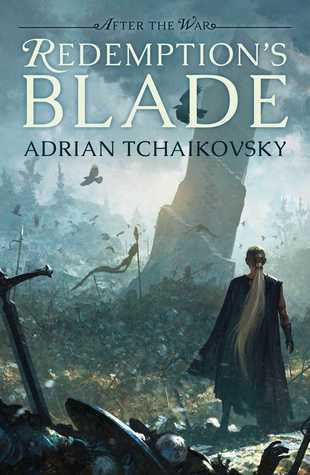 In order to do that, there’s quite a lot of flashy magic, combined with some kinetically charged and rather visceral fight scenes, both of which kept me turning the pages. They were helped along by Breed’s pragmatically selfish character, which came with enough raw emotion to make him feel like a person, behind the words. Possibly not a very nice person, but that wasn’t in the brief, after all. There’s also a fair amount of plots and byzantine villainous schemes, backed by some people who are Very Bad Indeed, and whose tearing up the page is an absolute delight. 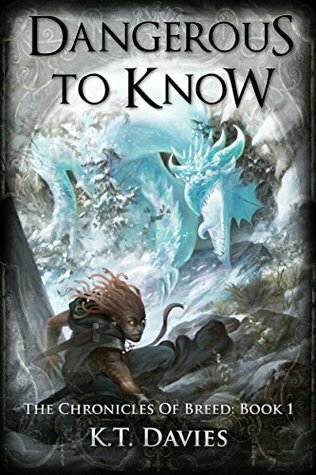 This is a thoroughly entertaining, unconventional and imaginative fantasy adventure – and one it’s worth your while to read. The Poppy War is the debut fantasy novel from R.F. Kuang. It’s a thoughtful piece, looking at colonisation, cultural constructions, empire and authority, atrocities, and philosophies of violence. Mind you, it also has snappy dialogue, explosive (often literally) magic, a world where the strange and the familiar intermingle, and characters which will make you laugh, cry, and scream – possibly all at once. It’s an incredibly impressive debut, one which explores some dark places, but does so with such honesty and imagination that it’s impossible to put down. As you may be able to tell, I rather enjoyed it. 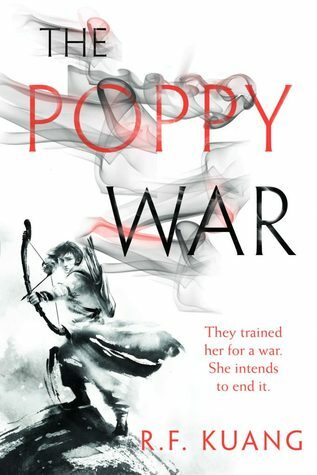 The world of The Poppy War is one shaped by empires. There’s the one in which we find ourselves, as an example. A sprawling creature, split into provinces governed by separate warlords, it still has a history. That history is one of violence. Originally separate kingdoms, bound together by strongmen into a nominally functional unit, it was broken apart by a colonising force. After years of warfare, it’s been reshaped to the current form, ruled by a survivor of three heroes that led the fight against the occupation. There’s a history here – one of assumed culutral superiority and arrogance, clashing with the reality of pulling out from under the hand of an occupier. That the occupation ended due to the intervention of a third party is the icing on the cake of identity. It’s a land with heroes, yes, and with a recent history of successful resistance through unification – but a far longer one of internecine conflict and division. So there’s politics. There’s scheming and the need to decide who controls what, and always, hovering on the horizon, is the understanding that the historical occupying forces could be back this time tomorrow. It’s a space which is rich in history, but also rich in gods. Divinities, lore, magic, are all ideas floating at the edge of the cultural consciousness. They’re maligned, to be sure, considered folk stories and traditions, but they help the seamless, sparkling tapestry of the world leap into life. If the larger world is one of wars, of realpolitik, of tax farmers, of drugs and swords and blood – there is a liminal space here, one in which fire and hope burn together. In a world of formal exams, maintained by and for the elite with a façade of meritocracy, in a world where drugs are forbidden and pervasive – in that world, if and when magic is real, it can shatter lives. Kuang has constructed a geography which evokes tones from our world – the colonial adventures of the 1800’s, the sociocultural tensions of the Quing dynasty – but gives them a unique spin, one which adds a mixture of blood and sparkle. This is a world of potentially necessary horrors, and the monsters who builds them – but also one of wonders. Sometimes those are built by the same people. Our protagonist, living in this space is Rin. Rin comes from nothing. Rin is not meant to be anything. But Rin is stubborn. Rin persists. Rin has fire and determination, and a bloody-minded desire to stick it to whoever has annoyed her. Rin is smart. Rin is cynical. Rin kicks serious arse. And Rin pays for it. In some ways, this is a hopeful book. Rin doesn’t have a thing. She’s trying to escape her dirt poor town, and its dirt poor prospects, by becoming something else, something , if not better, at least different. Rin, an orphan, struggles to define herself against the expectations of the world around her. She claws back every inch. In between confounding others expectations, she also manages to be better, rising from the social constraints of her upbringing to have a fighters control to go with her spirit. In her interactions with magic, Rin learns, to be sure, but she carries a kind of icy pragmatism, a banked rage and determination which binds some of her self-worth to success, however she defines that. But what she’s really looking for is identity – to either become what her unknown past inspires, or to be whatever she can make of herself. Rin also makes some hard choices. I’m inclined to call them bad choices, but the texture of the book wouldn’t allow it. This isn’t a place with simple decisions. It’s one where using power has bloody, horrific consequences, mostly for others – and where not using power also has bloody, horrific consequences for others. These decisions sit on a razor edge, and Rin’s struggle with her own capacities, with her own choices and their consequences, helps to shape the book. I’m not sure I agreed with them all, but I understood them all – and both Rin and the reader will come to understand the price which she pays for each decision made. This begins as a story of a young woman growing into her power, but then sidles into a narrative about the consequences of using, or refusing to exercise, that power. The plot – well, no spoilers. There’s a school, and it teaches martial arts. It teaches tactics and strategy. It may or may not teach the mystical. Rin finds herself there, in her journey to discover herself, and to pay the costs of doing so. But it’s not just a school story, Harry Potter with blod on knives. It’s also a story of war. Of battles. Of lives taken and lives broken. Of atrocities. Of hard decisions taken in despair, and bloody decisions taken in hope. There’s magic. There’s a lot of fabulously kinetic single combat fight scenes. There’s politics, there’s military infighting, there’s gods and magic and more than one hidden agenda. There’s a coming of age story with carmine blades and a whiff of the mystical extracting a price no-one should pay. Is it any good? Absolutely. The book kicks arse, and I couldn’t put it down. It’s a cracking debut, and one I recommend without reservation.